After an unrelenting administration has refused to listen to protesters on a 17 day relay fast, the leader of the NBA will go on an indefinite fast from July 21. The fast is in protest against the aggressive push of the Gujarat and Madhya Pradesh governments to aggressively push through policies that are gravely affecting people's lives and harming the environment. Bhopal, Madhya Pradesh | July 25, 2017 : The Sardar Sarovar Project had been initially pushed in the name of the drought affected in Gujarat. The construction of the dam, say the protesters is being pushed through without completing the fair and just rehabilitation of thousands of families in Madhya Pradesh. The government of Madhya Pradesh with the blessings if the government at the centre has been making preparations to forcibly evict families, including young children and the elderly. Pathetic tin sheds of 180 sq. feet are being offered as re-compense for rich agricultural lands that was also home to cattle. The forced submerge nice is estimatedto impact an thousand year old habitat and affect an astounding 400 villages. A press release by the Narmada Bachao Andolan (NBA) said that yesterday, July 25, the state brought in the police force and carried out a mock drill in Badwani and also continued with its intimidation tactics towards vacating the villages. The NBA has said that opposition political parties including Congress, JD (U), Left Front, AAP through their elected representatives and office bearers, have taken cognizance of & supported the people’s struggle by raising their voice at the democratic forum of Madhya Pradesh assembly and parliament, They have endorsed the people’s demands for their rights and opposed the submergence as well as eviction without rehabilitation. Despite this opposition voice, the Shivraj Singh government seems to be determined to use force and violent measures. The time schedule with a plan to raise the water level by few metres every ten to twenty days is another conspiracy acting like a slow poisoning aimed at killing local communities. It is against thus systemic and structured violence that the 32 years old nonviolent movement of the people from the Narmada Valley - - Narmada Bachao Andolan--has announced the indefinite Mass Fast from July 27, on the banks of the River Narmada. The government is pushing through, unconcerned with the views of the dam affected. There have been no efforts at fair dialogue. As per the Madhya Pradesh Government notification (dated 25.5.2017), 18386 families of villages will now have to vacate their homes and the village. It has been alleged that the official, government lists have a number of flaws: for instance, the families who have left decades ago or the others who were removed on the grounds of the reduced back water level and related exclusion of theirs, have also been included & directed to leave by July 31, 2017. On the other hand, many families and those who have been residing here for generations and are also affected by the submergence have been left out! The reality, according to MBA, is that 192 villages and one township that inhabits about 40,000 families will be affected when the dam height is at 138.68 metres with the highest flood. Madhya Pradesh that is facing such a huge loss through submerge nice will not benefit from the dam. Not a drop of water will be made available to Madhya Pradesh from the Sardar Sarwar dam. In these circumstances, the NBA says, it’s shocking to see that the state has not hesitated in sacrificing its living communities. One of the main grievances against the MP government is its use of false claims across the world, about the Sardar Sardar project, at different fora, as a symbol of development. The NBA claims that in Gujarat, not completing the micro canal network, the state has diverted the canal waters to large corporates like Coca Cola and even the Car industry, whole "selling" the project in the name of the drought affected. This year when the Narmada Waters reached Saurashtra, it is not a coincidence that the heavy rains (about 22 inchs in 2 to 3 days) have led to flooding of dams which were to be filled with Narmada leading to some overflow. The army had to be called and at least 5000 people had to be evacuated first in Gujarat even before the forced evictions in the Narmada Valley. The NBA has been arguing that this has been happening once every few years and has raises a question within Gujarat: whether or not the state should have decentralized water management, to avoid such huge destruction? Madhya Pradesh too would accept, in any rational discussion, that it doesn’t require any more power since its own power projects, such as the Bargi Power Plant are closed and left idle. Why cannot both states, take a decision to defer impoundment until the Relief & Rehabitation is complete? The MP chief minister, Shivraj Singh, it is clear and obvious, is not for any dialogue with us who can bring into a rational public debate, data & documents that can prove as well as challenge state claims. This obdurate and refusal to discuss the possible inadequacies or fallout of submerge nice is unacceptable in a democracy. So far, the only people get gas dialogued has been in his party and Sangh Parivar colleagues. The groups he has talked to, says NBA, has included middlemen. No action has been taken by the state government on the nexus and corruption exposed intbe 7 years long enquiry by Justice Jha Commission. Today, even the Modi Government has totally ignored the social and environmental consequences of the submergence: the dam height of 138.68 metres, the Government of Madhya Pradesh seems to be ready to sacrifice the lives and rights of lakhs of people with police force and water floods. The state has not only misinterpreted the order of the Apex Court dated February 8, 2017 but has also left hundreds of farmers / landholders deprived of the package granted by the Supreme Court. Instead of constructing all civic amenities at the R&R sites and creating a situation conducive to shifting of the oustees to the sites, the state is focusing on erecting temporary structures, the tin sheds, spending crores of rupees where there is no permanent facility for either drinking water or water availability for building houses. THe government is going ahead with constructing food camps with contractors to feed 20 thousand people at each camp, at the cost of 66 rupees per person per day. In the place of permanent road to be constructed, it is spreading fine crushed stones on the mud-roads. The plan is to force various categories of landless, artisans to doctors to the rented houses, if nor the tin sheds, pushing them out and killing off vibrant, local, living communities by drowning. The Chief Minister, who merely expresses lip sympathy with the oustees, is certainly not for resolution of conflict, but for war, says the NBA! The Prime Minister is performing rituals ignoring the people: he has called for the chief ministers of 12 BJP ruled to converge on August 12 to perform a religious ritual(arti) with 2000 Sadhus coming from Varanasi. Hence, after waging a nonviolent battle with People’s Power over 32 years, the NBA has announced an indefinite fast. The appeal is to the better sense of politicians. 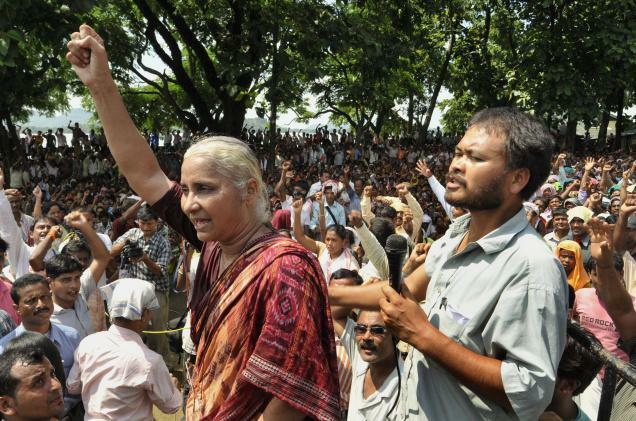 They have resolved to stay out on the banks of Narmada & continue to fight.